Well, it’s been a few days since we’ve been back home after the whirlwind that was BreakOut West - Western Canada’s big music industry conference, music awards, networking and showcase event! We’ve slept off most of our exhaustion and have emerged with new excitement, energy, and direction. Through the four days we spent in Kelowna, BC, we attended conference sessions on a variety of topics including women in the music industry, social media marketing and storytelling, releasing music in a digital age, production and mixing, and the list goes on. We also got the chance to sign up for 1-on-1 (or 1-on-2 in our case) speed dating type meetings with industry types. Among the meetings we had which we took all sorts of helpful bits and pieces from, was a meeting with Allan Reid, CEO of CARAS (which is the umbrella organization over the JUNO Awards, the Canadian Music Hall of Fame, to name a few), and had the pleasure of talking through our approach, our music, our appeal, with him. We certainly came out of all the 1-on-1s with a lot to chew on. Oh, and dare I forget the showcases? Oh my gosh. Over the course of the four or five days, there were SO MANY SHOWS to go to! Did we make it out to many? No way, we were SO EXHAUSTED after all that networking, session work, and connecting. Haha! But we did make it to a few. And it was incredible. And how could we talk about BreakOut West without the mention of our own showcase? Well we were slotted into the mini-BOW which was a super fun family showcase. We got to play alongside some spectacular other children and family artists and have an excellent time. The place was packed out with kids, parents, industry types, and all sorts! Lots of ribbons, friends. Lots of ribbons. And now we’re home and rifling through all the mental notes we took. We’re making plans, we’re taking all that juicy goodness and infusing it into our path forward. So many thanks to the hard-working group that put this on, and for having us out to participate!! Yeeehaw! What a summer it was! While it felt much like summers of our childhoods, seemingly stretching on for miles and days and great long swaths of time, we now sit at the beginning of the fall, at the cusp of a new school year and the beginning of a new cycle in the music world, and I feel like it flew by in a flash. Fall is a time of year that always makes me excited. Whether it's because I love the days getting cooler, wearing pants and long sleeves, seeing nature change colours and become crispy and crackly, seeing my breath billow in the air as I walk outside, or because routines begin anew, people go back to work, kids and teens head back to school, and my own work schedule sparkles with a shiny, excited newness as I establish fresh routines and determination. I start wanting to wear slippers and bake delicious treats and sip hot drinks and drape cozy blankets over my legs and curl up with the dog on the couch as I read a book. These are the days of happiness in my world, and of honing in on plans and To Do Lists and action. And when it comes to the music world, this is the time that we start looking towards the next summer's bookings. Summer festival applications happen in the fall. I learned that the hard way in our first year doing music, and was left empty-handed with no festivals to speak of that first year. Once I learned the rhythms though, I got going, and the second year, with a lot of work and push behind our submissions and applications, we got into a few festivals, and this summer we got into more. Every year it builds, and at every new ground we arrive at we meet new people, make new connections, and find new doors opening. 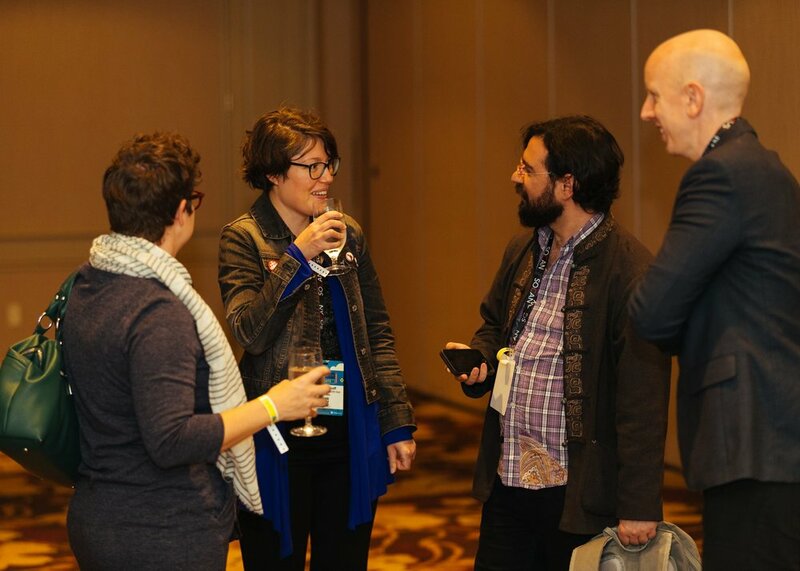 It is heartening to experience that people are still truly at the heart of the industry, and that it's networking, connecting, and building relationships that is what helps us move forward, rather than being tech-savvy (although that helps), or a smooth communicator (although that helps), or having the very best music (although that would help also). They say that it's not the best artists that succeed. It's the hardest working ones. AND LET ME TELL YOU, WE ARE WORKING VERY HARD!! But I digress. This summer, we made the most wonderful connection with the most wonderful band called the Oot 'n' Oots. "A rock and roll band for all ages", these guys put on such a marvellously entertaining show as 4 brothers and one 11-year-old daughter. Family-friendly, hilarious, and extremely high-quality musicianship makes this a group that draws out giggles and admiration. And on top of that, they're really nice! 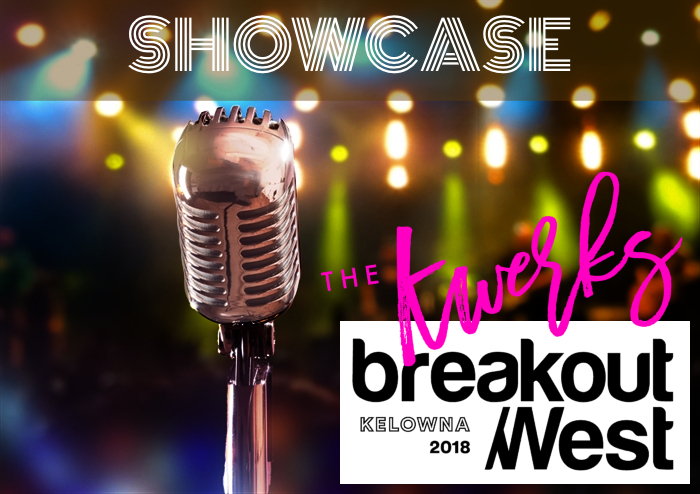 We sat eating lunch together one day at the Midsummer Music Festival where both our bands were performing, and got to talking about showcases, and specifically, BreakOut West, which is a big conference, showcase and music awards week that will be happening this October in Kelowna. Well through this conversation and some further steps, there arrived an open door for us to walk through. We are so excited to be able to announce that The Kwerks will be doing a mini showcase at BreakOut West! This means that we will get to play a set for an audience of both the public and industry reps, festival organizers, venue managers, promoters and managers and all sorts of others. This is an opportunity not only to get in front of the industry, but it's a new foray for us into the world of family entertainment. While we haven't identified ourselves as family entertainment, we have deliberately kept things clean with our music, and have known for a while that there are many small ears listening. In fact, a solid 1/2 of our listener base is families with young kids. So it feels totally natural and completely exciting for us to be testing the waters here. If you're feeling like coming out, the Mini-BOW (Mini BreakOut West), as part of the larger BreakOut West week, is a free, family-friendly event happening on Saturday, Oct 13 in Kelowna, BC. There will be 4 bands showcasing (including the wonderful Oot 'n' Oots!) and it will be a great time!! Apart from that, we hope to make some new, solid, helpful connections while we're there. Wish us luck, friends! What a weekend we had! To round off our summer 2018 tour, we had a double-festival kind of weekend, and had a really great time whipping up the crowds and feeling all the feels. And that's the thing. For all the gushing we've done over connecting with audiences, talking to you all after shows, and loving hearing how the music as made you feel, there's just something so good that we get out of simply performing and digging into the moment on stage. Getting caught up in a song, losing ourselves in a harmonious wailing moment, feeling the rush of an inspired guitar solo, and all the other moments that we get to experience as a band - there is little to compare it all to. And so, on Friday afternoon, the six of us packed up the rental tour van and headed out on the road and into the desert - 4 hours into the Canyon and into the heat, aiming for Spences Bridge, BC. As we drove, the thermostat registered hotter and hotter temperatures ....35 .....38 ...39 ....40 .....42. Yes, 42 degrees celsius. That's how hot it was when we arrived at 6PM. The dry breezy air felt like someone was aiming a hair-blow-dryer at us. We unloaded into our hotel rooms and hustled down to the festival grounds to get set up. The festival was well underway when we arrived, with kids dancing and doing crafts, locals and festival-lovers set up in the shade around the main stage, and a happy beer garden crowd sipping and taking it all in. The sun started to set and we took the stage, got them up dancing, and had a load of fun. What you can't see in this photo are the insane BUGS flying all around us, and particularly around drummer Tim! The morning was BEAUTIFUL. You know, every time we hit the road and drive around our province we are astounded at the beauty. From rainforest to alpine to desert to coastal foliage, there is such variety and the colours and sights and smells just keep changing. This particular morning filled our of the desert, with freight and passenger trains passing through, eagles flying, and the river meandering by. Sipping coffee with that morning scene all around us was pretty amazing. Off the patio of the Inn at Spences Bridge. On the road again though, because we had another festival to get to. Kaleidoscope Festival of the Arts in Coquitlam. This one was looking good - their marketing was amazingly well done, and they had booked some GREAT acts, including the headliners The Philosopher Kings. We pulled in and unloaded, freshened up and got set up, and then it was go-time. WOO! What a fun time we had! The crowd was sweet and the stage management was tight and professional. It felt great! And with that, we packed up and went home, and are now done for the summer. It's a bittersweet thing for Ryan and I, since we've been juggling family life with life on the road and honestly, it is exhausting some days. But the end of the string of performances is hard to come to, even with some great and exciting things coming in the fall. (More on that in another post...) The rest of the summer is dedicated family time in Kwerkland. We're zero-ing in on our kids and taking a music break, and will be back with a fury in September. To all of you who came out to a show (or five) this summer, thank you. To all of you who have tracked along with us as we've gallivanted around the lower mainland and province, thank you. To all of you who support us, thank you. To all of you who have up and danced, waved ribbons, bought music and merch, laughed at our jokes, and told us your stories, thank you. See you soon. Much love. In the picturesque rolling hills only twenty minutes outside 100 Mile House sits the storybook village of Forest Grove - a spattering of homes, farms, and a few community buildings comprise this village, and on the elementary school grounds is where we spent the weekend of July 27, at a lovely festival named Hootstock. Run by the kindest of people who not only headed up the entire event, booked a buttload of acts, and managed all the logistics, they also ran the kitchen, wandered around connecting with festival-goers and artists, and made sure everyone was happy. And for the hottest of hot weekends, we truly were. Connecting with people is what festivals come down to for us Kwerks. Whether it's other artists that we talk with over meals in the back rooms, volunteers who give their time and energy up for the love of the festival atmosphere, or festival-lovers of all kinds that come out to hear the music, our heart rests with the people. And Hootstock was GOOD for this. From one act to the next, you would never guess what "genre" of festival this was, because it jumped between genres faster than you could slip off your flip flops to have a barefoot dance in the grass. An all-girl punk rock band, a master of the spoken word, an incredible illusionist, a hilariously crass musical comedian dressed like a Dallas cowgirl, a folksy duo with 5 children, a 3 piece with gritty rock combined with magical soundscapes, and the list goes on. Such fun to be included in this array of sounds! We the Kwerky duo played two sets on the main stage, and enjoyed the rest of the artists, the banter over meals and turns at the merch area, and cooling off swimming in the lake nearby. By the end of the weekend we felt full and happy and ready for the next adventure, which would be upon us in no time at all! Thanks to Steve and Astrid for all your work, the volunteers and the artists we connected with, the people who came out to enjoy the festival, the lake that cooled us down, the food truck that gave us ice cream, and the beauty of the place to relish as memories. We were utterly tickled pink this year to learn we were going to be included in the lineup at Mission Folk Music Festival in beautiful Mission, BC! And what a weekend it was! Being only 45 minutes away from our home, this was a community that we were somewhat familiar with. Tucked deep in the Fraser Valley, this little community boasts the warmest, most welcoming, most concentrated pack of extremely talented musicians you can find in the lower mainland. And their folk festival is a beautiful example of the culture that exists in the town, filled with artists and musicians both local and from further afoot, with many coming out to support, volunteer, or just plain dance themselves silly. The festival has been running for 32 years and it was impressively smooth, well-run, and pretty much everyone behind the scenes was having as much fun as the audience! We Kwerks had the honour of opening the festival on Friday night, and what a fun set it was! Packed with energy, our usual goofiness, and loads of fun, the audience was up and dancing with us in no time at all! The following day we were slated for a collaborative set with a fine and unique artist called Strangely. This guy was an accordion-toting entertainer from Bellingham who makes audiences laugh to tears through his antics, lyrics, and showmanship (including but not limited to climbing on top of an upright bass while playing and singing)! The collaboration, while a new experience for us, was a hoot, and so much fun! Later in the day, I (Laura) had been slotted for a workshop called "Women in Song" and was put on stage with 4 other amazing artistic women to perform a few songs each. It was a huge honour, as I sang my songs and was accompanied by the likes of Cara Luft, Pharis Romero, Babe Gurr, and Celeigh Cardinal, all accomplished, recognized and award-winning artists. Overall, Mission Folk Music Festival was a wonderful time, with a great, colourful lineup of artists and acts. It was such fun to be a part of it! There's something magical about taking to the road and heading out of town to a music festival. BC, if you can believe it, has over 400 festivals! Each one has its own charm, culture, and atmosphere, and this summer, we're going to be experiencing 4 of these festivals, and telling you all about them! This past weekend, Canada Day long weekend, we headed out for the 13 hour drive to Smithers, BC for the Midsummer Music Festival. A well established, family-friendly, warm and welcoming festival that has been going for 35 years, and it shows. The volunteers, organizers and staff all seemed relaxed and happy, and were a very welcoming bunch! From the five different stages, extensive children's area and activities, food trucks and vendors selling the most delicious treats and treasures, and the professional and chill sound tech team, the whole thing felt like a well-oiled machine. Hundreds of people came out, and the artists, about 20 different groups, were a mixture of local and further afoot summer touring nomads, like us. The crowds were engaged and dancing, laughing and having loads of fun while we artists moved in and out of our sets. A really fun part of the festival for us was getting to play a set on the kids' stage! While we haven't ever identified ourselves as children's or family entertainment, we find that no matter where we play, we often have a contingent of small humans dancing away to our music, and enjoying the show as much as the adults are. As so we got booked onto that kids' stage for a set, and WAS IT EVER FUN! 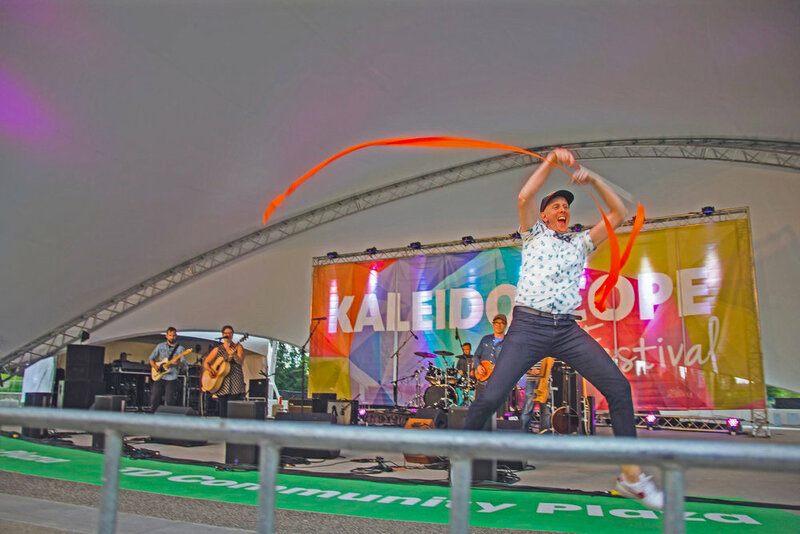 Naturally, as it's summer now, Ryan has unearthed his dancing ribbons, and kids and adults alike can't get enough of his crazy moves, and love getting a chance to use the ribbons themselves. The thrill was real when we were booked for this festival, however, and were given TWO sets on the main stage - one on the Saturday night and one on Sunday afternoon. It was just amazing, and the crowds had as much fun as we did, dancing and grooving along while we ground out our tunes. We played all our usuals, Carry Me, Freight Train, Stuff Song, and some of the new songs - Orion, The Drum Song, Firelight. All was received and enjoyed with smiles and dancing and attentive listening and laughing along with us as we bantered between tunes. Overall, the whole weekend was a total success. The people were wonderful. The music was amazing. The magical extra acts (First Nations Dancers, Illusionist, etc) were all just excellent to watch and participate with, the crowds were supportive and happy - it was a wonderful time! *Photo credit to Teresa Porter and Airless Photography. We couldn't be more tickled to hit the road in a few days and start our summer tour! Last summer we had the extreme pleasure of playing at a few festivals in rural BC and absolutely fell in love with the wild beauty of our province, and the utterly lovely people we encountered! This summer, we are expanding further North, further East, and building on what was an excellent local performing circuit as well! We are continually amazed and so thankful for such a passionate and caring army of people that propels us forward (THAT'S YOU, KWERKNATION! ), so thank you. Much love to you. Hope to see you at one or more shows this summer. It's about time we got back to the wonderful, 100-year-old Kingfisher Farm Barn! This is the very location where we released our very first, very new EP! Remember??? Well, we're back on June 9, 2018 at 7PM, three years later, and we're bringing our BIGGER BADDER DREAMS show to the stage. It will be a fun, foot-stomping, raucous laughter kind of night! Come on out, will you? Tickets are $18 in advance, and $20 at the door, with kids at $5. LIVE MUSIC is where it's at. It had been some years since I had been to a live show. Sure, I had been to plays, musicals even, and the odd production of one kind or other, but it really had been a long time since I had really been to a concert, listened through a set, heard the stories, listened to the lyrics, felt the feels. And then I sat there, and the music crept towards me through the air, reaching it's tentacles around my body and through my hair and into my ears, and right down into my heart. Music is a language, and not just of words, but of emotion, and depth, and soul-shaking connection. You enter into a normal room, with some equipment, and some chairs, and some other humans, and in a short time, the room becomes an ocean of sensation, floating around you and through you and between you and all the other humans in the room, and it connects you all and causes all sorts of stirrings. Whether a massive stadium filled with thousands of people, or a house concert with 20 odd friends, the experience of music is magical. The connection that happens between artist and audience, the way you leave feeling like you've been given a gift, the way that you feel like you've been through some kind of therapy session - it's magic. It was only recently that I had a discussion with a friend about the fact that music, for me, is live. I mean, music HAS to be live. Recorded music, well to me it's great because you can take it home, and listen anytime, but the real thing, the live experience, that's where the magic really happens for me. That's where the energy between artist and audience really dances. The audience engages by listening, and absorbing, and feeling, and giving back in facial expressions, body language, laughter, tears. The artist provides the stimulation and dances with the audience's reactions, altering, changing, shifting as they sense the lifting or lowering of the mood, crafting a journey through the set with notes and lyrics and moments of quiet. It is an amazing gift to be able to do this as my work. And as we prepare for upcoming shows, and try to get the word out, market, try to sell tickets, and get bums in seats, it can feel like I'm a used car saleswoman. You know? Sales are not my passion, because sales can feel like a cheap and quick money grab to me. And yet, there's this amazing gift that I want to give, and that's the whole point. It's a gift to both artist and audience. It's an experience, and you really can't get it anywhere but a live show. So if you haven't already, I really encourage you to take the time to buy a ticket. It's money so well spent. Get a ticket to any show. Any band you like. Any artist that sounds interesting to you. And then show up, and experience the magic, and feel the feels, and enjoy an escape from the stresses of life, and thank your lucky stars. Can you believe it??? We Kwerks, after making it through the rounds last year, propelled by our amazing army of voters, KWERKNATION, and landing ourselves in the TOP 25, have managed to go further this year! Yes, once again, our dear fans and followers have pushed, nay propelled us into the NATIONAL TOP 10!! What a rush this year's contest has been. It was a risk taking the plunge a second year in a row. What if we didn't do as well? What if KwerkNation was tired of voting? What if, what if, what if??? But at your bidding, we entered again and went even further! Now, a huge congratulations to the winner of the contest, AquaKulture, and his song "Sure" for taking the top prize. We love his story and admire his unique style! And to go forward, we are just sitting here, feeling so thankful for all of you. What more could we ask for as artists than to have enough of a network of encouraging, enthusiastic, good people like you backing us up? I will be plain here. It's a dream come true. To enter into art and put yourself on the line, on the stage, into total vulnerability, is no easy task. To have such a response as we've had....thank you so much. A million times. A bajillion times. Hey, so what if we're preparing for the biggest, most magical album release? Why don't we just throw a major national competition into the mix? YES PLEASE! CBC SEARCHLIGHT HAS JUST RECEIVED THE KWERKS' SUBMISSION, MY FRIENDS. Want to join the fun and help us get daily votes? 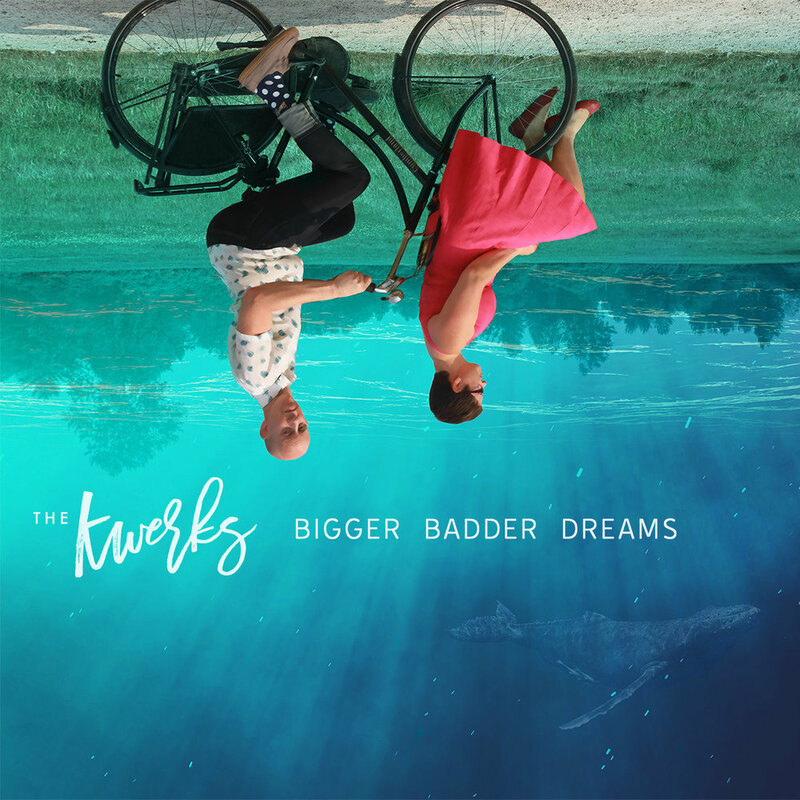 We are THRILLED to announce the upcoming release of our new album, Bigger Badder Dreams which will be available for purchase on March 2nd! 1 - AT OUR ALBUM RELEASE CONCERT (see info below), or any other live Kwerks show. See our tour dates here. We've got some great shows lined up for you! 2 - OFF THIS WEBSITE - by clicking here. Both physical CDs and digital downloads will be available here, starting on March 2nd. For a married duo that have three kids and a band comprised of dads, The Kwerks have managed to accomplish an incredible amount in the past 2.5 years since they kicked off their project, and 2017 was no exception. The band continued to make the rounds throughout the lower mainland and Fraser Valley, where their fan base eagerly packed out venues and soaked up their easy-going vibe. round 2), and on the national level, made it to the top 25 (Canada wide - round 3), all awarded by popular vote, thanks to their engaged and enthusiastic fan base. Their online presence, including their comedic music videos, won the hearts of many, but they truly shone when they get to perform live for audiences. Bantering between songs, making audiences laugh to tears, and blasting listeners hearts with relatable and authentic songwriting, the band is enjoyed wherever they go. Summer 2017 brought their first foray into the festival circuit, with appearances at the Music on the Meadow Festival (Fort St James, BC), the Downtown Victoria Busker's Festival (Victoria, BC), the Same Sun Summer Jam Festival (Surrey, BC) and the Tractorgrease Folk Festival (Chilliwack, BC). In the fall, The Kwerks were selected to showcase at the Northern Exposure Showcase and Conference in Wells, BC, where they won the hearts of many rural festival organizers and venue managers. Several newspaper articles published, hundreds of new followers on social media, a booking for a speaking engagement in 2018, and industry voices raving, the Kwerks were celebrated wherever they touched down. In November, Laura picked up a Frazey Music Award for "Excellence in Performance by a Female Artist". The Kwerks also held a "buy-one, donate-one" campaign in December - for every pair of Kwerky socks they sold, one pair would be donated to a person living in poverty, resulting in over 120 pairs being donated. The end of 2017 was filled with local Christmas concerts and the band spending a few weeks in the studio, recording their third EP that will be released in February 2018. The Kwerks are looking forward to 2018 with eyes set on expanding their audience even further, and building up their online presence, particularly in video content, but as their true love is performing live, they plan to stack the tour dates and keep doing what they do best - connecting with people, sharing laughs, spreading the love, and creating better and better live experiences for their fans. Aaaaah we're re-living some of our summer memories! Here's a snippet of our show at the Langley Events Centre in August. Well we've got a fully booked December, plans percolating for our annual Christmas video, we're recording our new album over the next few weeks, and we JUST FOUND OUT that we've received TWO NOMINATIONS for Fraser Valley Music Awards! This is pretty amazing, friends! Feeling awfully thankful right now. Want to see the announcement? CLICK HERE. A shot taken on a walk in Pemberton while Laura Kwerk was on a recent artist's retreat. While Laura Kwerk is quite well-practiced in the English language, she certainly has a penchant for making words and phrases up to suit her songwriting needs in any given moment. From "a titch" in All Yours (which turned out to actually be a legitimate saying), to "find your loud" in Little Fighter, to the sassy "bigger, badder dreams" in the recently written Fire Light, the cheek is apparent in her seemingly nonchalant disregard for grammatical etiquette. When asked about it, she remarks with a smile, "But I like it." Fair enough. Fair enough. And we like it too, Mrs. Kwerk. The big question we have, however, is centred around the newly written song, Drummy Dün Dün, cheekily named in a moment of agitation around song naming, and within it's lyrics can be found....wait for it....a REPEATED aforementioned phrase: FIND YOUR LOUD. What, pray, does this phrase mean? LK: Well, when I first came up with this phrase I was writing the song, "Little Fighter", which is all about digging yourself out of the fear-cave and getting yourself onto the track you know you're supposed to be on. Fear can cause all sorts of stunting, and keep us from really doing what we're built for as individuals, what is best for us, and ultimately for the world at large. The amazing thing about humans is that we're all made so differently, and while I may be made to write music and connect with people through it, another person might find their passions focussed on scientific study, or teaching, or counselling, or <insert a million other things here>. The phrase "find your loud" is all about figuring out what your particular expression or passion in this life might be, and seizing it with everything you have. Too many people are walking around this place with blank, sad expressions, not having ever dug into what makes them feel alive. I feel like part of my job as a songwriter is to expose some of these things, and get people thinking about themselves and their lives. Okay, but why did you use the same phrase in your new song, Drummy Dün Dün? LK: Oh right. So, I sat down to write a Christmassy song, because you know, the season will be here soon and I need to be prepared!! So as I gathered my things together, guitar, notebook, pencil, brain, I tried getting in that Christmassy mode. You know the warm, fuzzy, lovey-dovey happy mode that we're supposed to feel at that time? Well, at the time I was doing this, there were crazy hurricanes down in the Southern states and Carribean, there was a huge earthquake in Mexico, there were floods, and out-of-control wildfires, there were horrible reports coming in from Myanmar about the slaughters happening there, and there was crazy bad political stuff going on with Trump and the rest of the world, including North Korea. I mean, it felt like the sky was falling. So, I ended up writing this song with that very phrase "the sky is falling" in it, and throughout the song I'm feeling this horrible weight that we need to stop and take a stand for the sake of our fellow humans, and for the sake of this beautiful planet. We need to beat our drums together, cause change, help others, and generally *find our loud* voices for the sake of this earth. So, I guess in this song the phrase is used a bit differently, but there it is. Cool. Well that makes us want to hear the song now. Will that be possible? Where are you playing around Christmas? Sounds great! Well thanks, Mrs. Kwerk. It's been interesting picking your songwriting brain a bit today. 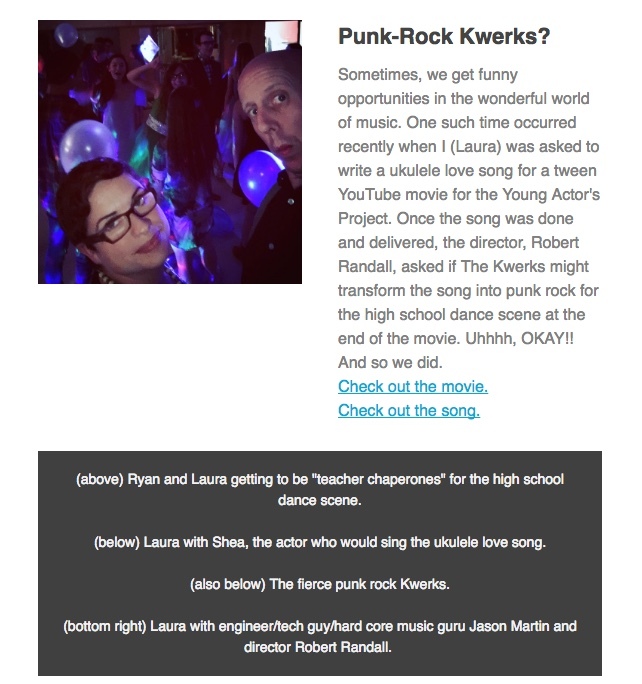 (This is a copy of our October Kwerknation email. Links in the content are not clickable, but see below for clickable links! INFO ON TICKETS AND SHOWS CAN BE FOUND HERE.